During one of our team meetings at work, a colleague asked us to share a great adventure we’ve had. She explained that it could be a little “A” adventure instead of a big “A” adventure. This icebreaker inspired me to participate in Jess Lawlor’s second Get Gutsy essay content. What I’ve realized after a year of reflection is that getting gutsy or stepping outside of your comfort zone comes in many forms, some grand obstacles that you overcome (like running my first 5K last year) or smaller, more personal moments. For me, all of them can be described as adventures. All of these adventures happened towards the end of my 2014. It was like the universe knew I’d need material for this essay contest! But regardless of the contest, I hope you’ll see your own meaningful moments that push you outside of your comfort zone and can happen in the most ordinary of circumstances. These are my moments, adventures that defined getting gutsy. Leading someone more senior than me at work – So this is probably fairly common. I was given a responsibility to train and mentor people at work who have more experience than me. At first, I was a bit intimidated, but I realized that I was more experienced in the subject so it made logical sense for me to train them. Also, these individuals were so open to it, which really helped me. How this is my getting gutsy: I overcame initial intimidation to achieve a team goal. 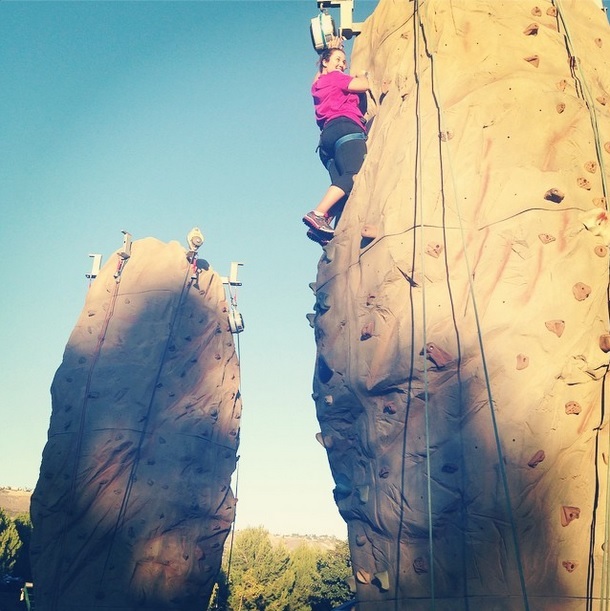 Climbing a rock wall – For almost a year now, I’ve been saying I was going to climb this particular rock wall. This past November happened to be the time I chose to do it. My first attempt was a train wreck: I only got half way up before I started panicking, shaking and eventually giving up. My co-workers were at the bottom trying to cheer me on, but that just increased my anxiety level. I ended up yelling at them (no bueno) and walking away. I changed my strategy for the second round and had only one person, who was coaching me at the bottom. I rang the bell (proof to the left!) and was SO ecstatic that I did it. How this is my getting gutsy: I overcame my anxiety and fear of failure to complete a personal goal. Going to church where they only speak Spanish: While visiting my friend in California this November, I attended church with her and her family. I think of this as a privilege so I tried really hard to not show that I was nervous. First off, this type of church was completely different from anything I had ever experienced. Second, the entire 90 minutes was in Spanish. Now, I can understand some Spanish and can kind of speak it (on a good day). But I always get really nervous of messing up, especially when with native Spanish speakers. I managed to gleam a couple of provoking thoughts from the mass and by the end, I really enjoyed myself. How this is my getting gutsy: I embraced a completely different setting despite being nervous and ended up learning a lot. Watching a loved one get sick – In the last month, I’ve watched someone very close to me get very sick very quickly. It’s sad, scary, painful and paralyzing all at the same time. But, I go, I visit, I read and pray. Some days, I feed or make jokes or sing songs. I do anything to make this person smile. Most days, I dread walking into the room, wondering if this time is the last. But, this is bigger than me, than any of us. How this is my getting gutsy: Being selfless and sacrificing is the best way to be pulled out of your comfort zone. I walked into 2014 eyes wide open, excited at all of the possibilities this year that to offer. The possibilities and lessons were endless and certainly caused me to grow up. The biggest lesson of them all: little “A” moments sometimes teach us the biggest lessons that put us so far outside our comfort zones that we don’t recognize our old selves. I leave you with one of my favorite songs of 2014 that truly captures all of my getting gutsy moments this year. Keeping You In Touch, One Story At A Time! A place to share my opinions and thoughts about all things public relations & politics. Look out for the occasional travel post as well! Surviving one cupcake at a time!